Our experienced Dallas and Plano podiatrist Dr. John Baca grew up in the metroplex area and earned his Bachelors of Science from Texas State University in 2008. He then graduated from Des Moines University in 2012. Following podiatry school, he completed a three-year surgical residency at The Western Pennsylvania Hospital in Pittsburgh, PA. The training program was developed with special emphasis on an interdisciplinary approach to lower extremity disorders including lower extremity trauma and complex reconstructive surgery. As chief resident his final year, he spent a week correcting pediatric limb deformities on underprivileged children in San Salvador, El Salvador. 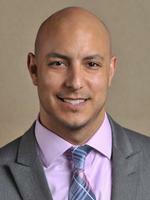 Dr. Baca specializes in reconstructive foot and ankle surgery in Dallas, TX. His extensive knowledge and experience in this sub-field of podiatry stems in part from his post-residency training. After his residency, Dr. Baca took the unusual step of pursuing a one-year fellowship at the world-renowned Weil Foot and Ankle and Orthopedic Institute in Chicago, IL. The fellowship incorporated all aspects of advanced reconstruction of the foot and ankle, including complex surgical correction and revisions on patients all over the world. While there, Dr Baca also worked on numerous innovative research projects including early weight-bearing protocols. As a Dallas and Plano podiatrist at Dallas Podiatry Works, Dr. Baca has a passion for personal health and fitness. He also has a special interest in advanced return to sport after injury/surgery and incorporates this into all of his treatment regimens. He has experience in the treatment and rehabilitation of high-level athletes and believes in getting you back to your active lifestyle as pain free and as quickly as possible.